Chile new years is celebrated on January 1st, just like most countries in the world. What makes it different? Well it’s in the summer, no snow or cold weather! The way people usually spend their new years is that they will get together at a friends or family’s house and have a new years eve feast. It’s very common for them to have an asado. They will wait until twelve o’clock then toast with champagne. Then they will either dance at the place they are at or they will go to a place were there is dancing and dance all night long. One of the alternatives people do is after the feast they will go to a particular spot to watch the fireworks that are displayed at twelve. 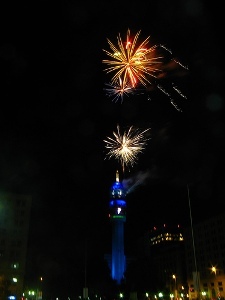 In Santiago everyone goes to see the fireworks that are at the Torre Entel . 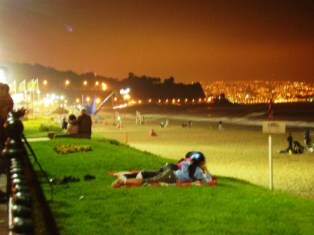 A very popular alternative to go see the fireworks is along the coast of Viña, Reñaca and Valparaiso. People travel from all over the country and some get there really early in the morning to get a good spot to watch them. Others take a picnic and blanket and toast on the beach while they watch the fireworks. I would say it’s one of the best places to see fireworks in Chile and I counted a row of 9 fireworks being displayed, but it’s very hectic on the way back. This sector is so crowed that there are no hotels available and if you want to drive back to Santiago get ready for the huge traffic jam. But if you plan ahead and reserve a hotel and walk to the coast and back, then it’s worth it. There are a lot of very superstitious people that do a lot of traditional things so they new years will be a good one. Here are some of the things people do. •	Empty Suit Case: Walk around the block with an empty suit case, doing this will mean that you will take a trip in the incoming year. •	12 grapes, one for each month: Eat one grape at a time and while you make a wish with each one. •	Lentils: Eat a spoon full of lentils, this means you will have money this new year. •	Dollars in Right Shoe: This means you will have money this next year. •	Yellow Underwear: This will make you engaged in the New Year. •	12 Candles: Light the 12 different coloured candles that have different meanings each. •	Gold Ring in the Champagne: Toast with a gold ring in the glass, this means you will get a marriage proposal this new year. These are just some of the things people do here to start off right the New Year. Others don’t believe in this things on don’t do them. But what most of the Chileans do have in common is that they like to dance and most of them, like I said before either they dance where they are or they do out to dance, and they do it all night long. This is why there are millions of new years party’s at discos and others organised just for new years. So if you like dancing just find a place and dance you’re head off. One piece of advice, take a taxi. This is also one of the nights with the most car accidents during the year and you want to be able to remember all the fun you had!